Skin issues and allergies are common in west highland terriers, unfortunately. Impawtant disclaimer: this blog article is just one doggy’s experience, and is not medical or veterinary advice. You should seek the advice of a qualified vet to treat your dog’s health. Your Westie will never get over its allergies if there are toxic weeds in your garden! 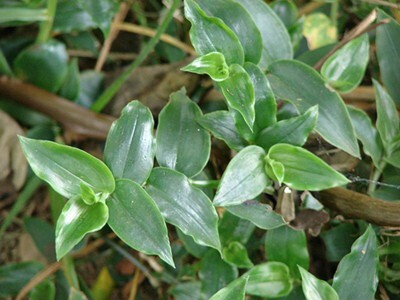 The plant that Westies seem to be most allergic to (in New Zealand, anyway) is Tradescantia fluminensis – known more commonly as “wandering jew”. It likes growing in dark, shady places and it is really hard to get rid of. A weed called “wandering jew” causes allergies in Westies. Image credit: Forest & Kim Starr. You will need to find out which plants and weeds cause allergies to Westies in your own country. The food your dog eats can really affect his or her health. It can take some trial and error to find out what works well for your dog. In short: you want your dog to be healthy, happy… and what comes out of the other end should be firm. 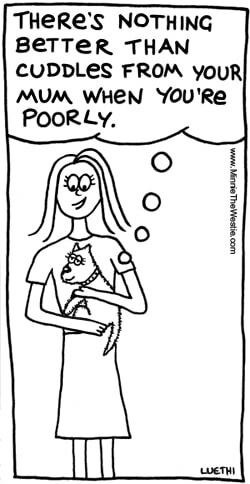 If your dog seems unhappy, sick, or has runny poops, they’re not a well puppy! Me, I eat a mixture of Hypoallergenic dog kibble, and home cooked chicken mince with brown rice, carrots and pumpkin. That gives me the energy I need, and I am healthy, with good firm poops! Westie allergies can be worse if your dog eats the wrong food… find out what food works best for your Westie. Other Westies I’ve met do well on a raw food diet. It comes down to finding the diet your Westie thrives on. 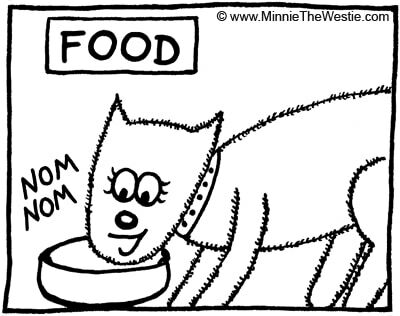 Remember to watch EVERYTHING your Westie eats – not just their main meals. I’ve met Westies who are fed raw food at meal times, and then given unhealthy treats and chew bars… and the owner is wondering why the dog still has runny poops! Also be careful feeding your Westies human food. Pawsonally, I cannot eat much of it without it making my tummy go funny. It’s just too rich for me – even if it smells and tastes nommy, it’s no good for my tummy! Another problem can be that because Westies are so cute, people want to feed us treats and noms. But these treats could be really bad for us, so your humans may have to train (or ask) people not to give you their noms. It’s very unfair, I know, but it’s the best thing for your tummy! It took a lot of trial and error to find out what would help my skin allergies the most. Should you or shouldn’t you bath your Westie regularly? There is a lot of conflicting advice on the interweb about whether you should or shouldn’t wash your Westie regularly. I think the best solution here is to do whatever works for your dog! Some Westies get worse after a wash; some feel better. Me, I have a shower every week or two. These days I actually let mum and dad know when I want a wash – I start staring at the shower! What shampoo or soap to use for Westie allergies? Again, it needed some trial and error to find the pawfect shampoo for me. Some Westies do very well with the medicated Malaseb shampoo from the vets. It didn’t help me though. Mum tried doggy shampoo after shampoo after doggy shampoo on me, but none of them helped my itchy skin. So yeah, use whatever works for your dog. 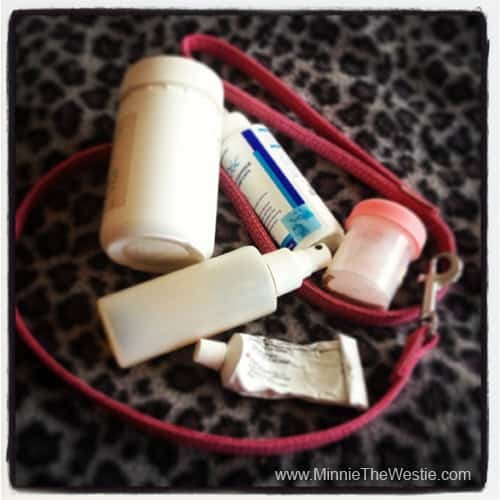 Minnie The Westie always takes a treatment kit with her on holidays, to treat any Westie allergies quickly. This can prevent Minnie’s allergy from getting worse – and saves on vet’s bills! Mum always keeps some remedies handy in case of an allergy outbreak: the quicker she can treat it, the less likely it is to flare up. Paws: I used to have a real pawroblem with itchy paws… a special spray from the vet sorts that out. Ears: I do get ear infections from time-to-time. It looks like we’re on top of these now, as mum uses special ear drops from the vet to keep them clean, which stops the infection from forming. Prevention is better than cure! Pee-pee: I’m prone to my pee-pee getting inflamed – especially after a trip to the beach… that sand is itchy! So mum keeps me trimmed and clean down there, and if it does flare up a special cream from the vet, plus a ‘Bladder Support’ supplement for dogs, sorts it out very quickly. Slimy poops: My poops aren’t so good if I eat too much human food, or dog food that’s too rich for me. Probiotics from the vet help sort this out. Mum always takes these remedies on holibobs with us… Murphy’s Law says that we’ll need them when we’re away from home! We’ve found that if an allergy flare-up is identified and treated quickly, it will often nip the problem in the bud, and prevents costly vet’s bills. Investing in some topical treatments could save you a lot of money in the long run. 4. 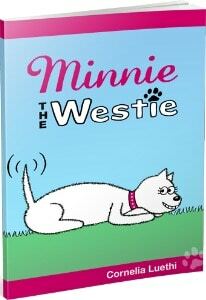 What if your Westie is in real distress with their allergy? One time my allergies got really bad. I wasn’t my usual, cheery self… I was very quiet. Mum and dad thought I was acting very depressed. The vet that we first saw recommended sending me to a doggy dermatologist (skin doctor) to have some allergy tests. This would have taken several weeks to complete, and cost thousands of dollars. However, it would not have brought me the relief I needed. It worked instantly! I was like a new puppy again! My new vet was part traditional vet, part homeopathic vet. After my allergies were under control with the steroid shot, I had a number of courses of homeopathic remedies. I have to be honest – mum didn’t think the homeopathic remedies would work. But you know what? They worked wonderfully! The homeopathic remedies did far more for me than antibiotics (which make me sick). They were pawsome! You see, the vet said that because I was the runt of the litter, I didn’t get enough nutrients from my mother’s milk. So my bowel didn’t develop properly, which is why I’m intolerant to a lot of food. The vet’s approach was to make my bowel better and stronger, and that way I wouldn’t have so many allergies and diet issues. I haven’t needed any more homeopathic remedies for years (paws crossed! ), and I do still have to be careful with what I eat. But if I stick to my diet (which is very nommy), I’m fine. That’s my experience of West highland terrier allergies – I hope you find something useful in this to help your Westie’s allergies! Remember: in most cases, it’s a case of managing Westie allergies rather than permanently curing them. And if your animal is in pain or distress, please see a vet. Oh Minnie: I do feel for you! Our Westie had terrible allergies which suddenly started when she was just six months old (we heard that was a common age to start..). We did have her tested and it was mold, dust etc. in the house. Well, we DID go the traditional route with allergy shots every single week for the rest of her life. We gave them to her, and she loved them!!! Lots of attention and hugs and kisses, you know… And she was fine from then on. So there are many ways of treating you wonderful doggies! Great info on allergy causes and how to help your pup avoid the “allergic reaction blues.” I don’t have an adorable Westie, but your advice was helpful to this Bichon Frise mom too. Thanks! Our Westie is a puppy-mill rescue and has lots of problems including the usual Westie allergies. We’ve been through all the usual stuff (including plenty of steroid shots), and like Minnie all except doggy Dermatologist skin tests. Having said that if those need to be done they will. In the meantime I noticed that dirt is especially troublesome to Bridgette which is something of a problem since she loves dirt pretty much over anything else except eating. Her digging is an absolute wonder to behold. Especially when she tunnels through an ant-hill. Bridgette gets a prepared diet similar to Minnie’s. Recently she experienced a serious bacteria and yeast-based skin infection which also migrated into a staph infection in her ear. Our vet placed her on an every three days bath with KetoChlor shampoo which is especially good for yeast and other fungal issues and is available on the Internet. This regime worked very well and since she gets so dirty in her normal days activities and naturally sleeps with us, this continues with the period varying depending on exactly _how_ dirty this dainty young lady manages to get. In our Colorado mountain winters she tends to stay clean so more days in-between showers. Summers – the dirt flies in all directs so less days in-between. He staph infection had to be treated aggressively and is now clear. Hi there, my westie Hamish suffers from skin conditions and every now and then ear infections. Your site has some good tips and it’s nice to hear what other people feed their westies for comparison. What tea tree shampoo do you use and what is the name of the ear drops you use to keep ear infections at bay?